I haven't shared the contents of my design wall for a long time. This one is almost done! After finishing my Sparkle Punch quilt I decided to pull out a WIP that has been sitting in a box for a while. 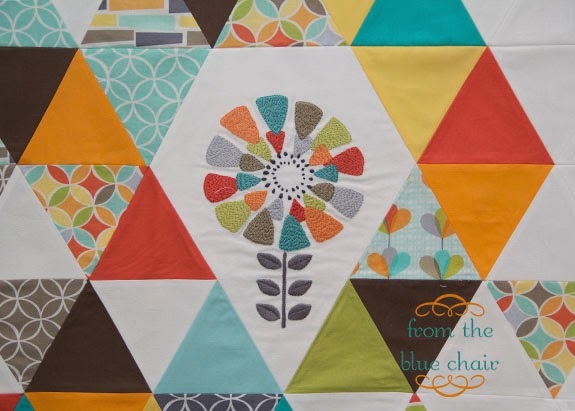 I started this project more than a year ago for the Michael Miller Challenge through the Modern Quilt Guild. Obviously, I didn't finish in time. I wasn't really that interested in the competition this time. I just wanted to make something with equilateral triangles. I have to finish piecing the top three rows, and then I'm done! I will likely piece a simple back for this one. I want to use up all my leftovers and will incorporate them into the design. The whole quilt was based around this embroidery project. I needed a summer roadtrip project last year and started this. I traced the design from the large scale print from this line. I chose matching colors and just started stitching. I debated actually including it in the quilt, but knew it would just get put in a box otherwise, so it is placed in the bottom right corner where I often place something unique in my quilt designs. Love it! Great colours and prints, and that embroidered block makes it one-of-a-kind. What a great embroidery idea and I love it with the quilt blocks!! 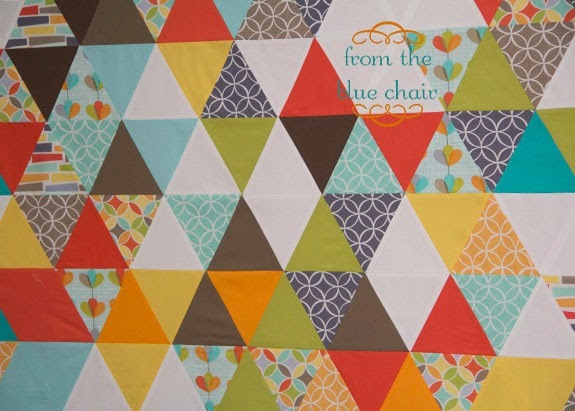 I love how we all started with the same fabrics but ended up with very different quilts! Your equilateral triangles are really pretty. This is going to be a great finish. And, you make me smile... every time I see a picture of a cornered design wall, I know I'm looking at yours. You can't ever change that, you know! Beautiful! I really love the embroidered piece. 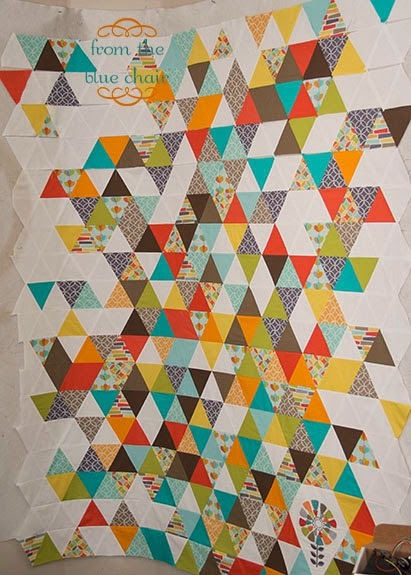 I really like the negative space scattered throughout the quilt - gives it a lot of interest.